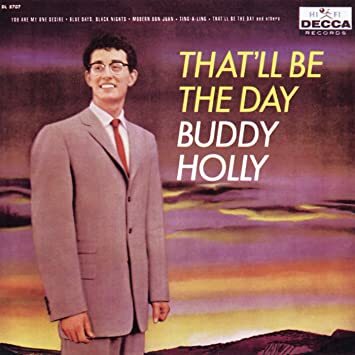 That’ll Be The Day was Buddy Holly’s first hit- it went to #1 in 1957 and would be the only #1 hit in his career. It was not only a big hit it was a fantastic record one of the greatest singles in rock and roll history. It was also a chart topper in Britain and was a huge seller in Liverpool. This was a big song for two teenage boys who lived in Liverpool. Up until this point John Lennon and Paul McCartney had both been rock and roll fanatics but on their own. In the summer of 1957 they had met- and That’ll Be The Day is the first song they took in together and learned how to play. 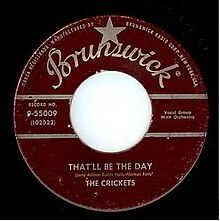 They loved everything about That’ll Be The Day- the performance on record blew them away but the way Buddy Holly sang with the hiccup , the electric guitar sound and they loved the name The Crickets. The vocal harmony also knocked them out. John took note of the fact Buddy Holly wore glasses. John wore glasses too but only at home- he was blind as a bat without them but wouldn’t wear them when he was out of the house. It wasn’t like he started wearing his glasses all the time now but he took note- a rock and roll star wearing glasses. Buddy Holly also wrote his own songs and they weren’t complicated songs. That’ll Be The Day was the first song John learned to play on his Gallotone guitar. Paul who was ahead of John as far as guitar playing at this point showed him how to play it. That’ll Be The Day and of course the great Buddy Holly would continue to be an inspiration to not only John and Paul but for a younger boy named who had yet to join up with them- 14 year old George Harrison. He would call Buddy Holly one of the greatest people for him because he wrote his own songs and was a guitar player- like George who was obsessed by guitars. From their early song patterns and vocals…you can hear Buddy Holly…much more than Elvis. I agree they may have first been smitten with Elvis but the Holly influence is more there!